Not two days ago would I have imagined this to be the year I would trek through the Himalayas, yet, as I'm learning more and more often, life treats you with the greatest opportunities from the least expected sources. 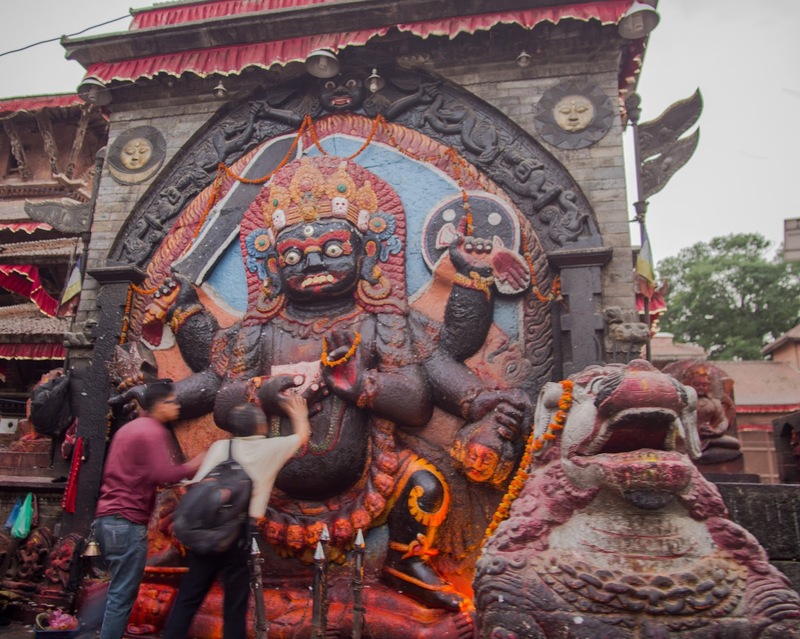 No sooner had I returned from a late-winter, light-hearted, large-grouped trip through the Ceahlău mountains when I chanced upon one of Adriana's (then recently Facebook-befriended) wall posts asking for people interested in a trek through Nepal. Although such a tiny question might normally have passed by unobserved, in the grand flow of superfluous facebook updates, or I would have noticed and dismissed it as too crazy or exotic for me, something inexplicably bade me approach her for details (keep in mind, we had met each other some 3 days past and exchanged minor pleasantries in conversations no longer than a quarter-hour). Things escalated rapidly, barely keeping up with my excitement at the prospect of visiting such a faraway place, and on March 8th, after making sure my prolonged absence wouldn't be an issue at work, I purchased the plane tickets. Time moved on quickly henceforth and before long our merry little band (consisting of Nicu - the initiator, whence the idea to trek Nepal had come, Adriana - the facilitator, whose advertisement had brought Adrian and myself, the two later arrivals to the group) had settled on the target (we would trek the Annapurna Circuit) and method (we would hire a local guide, mainly to enhance the cultural experience, and we would carry our full rucksacks, rather than hire porters). Our departures were on the 23rd of April (for Nicu, Adriana and Adrian) and the 26th for myself (due to a not negligible difference in price between dates, when I bought the tickets, as well as the need to finish some last-minute work related tasks right before leaving), and the two and a half months of preparations and anticipation simply flew by, thus did I find myself, on a hot April afternoon, after a short, 2 day visit to my mother and cousin in Bucharest, sitting on the floor of the fairly crowded Henri Coandă International Airport, waiting for my flight boarding to start. 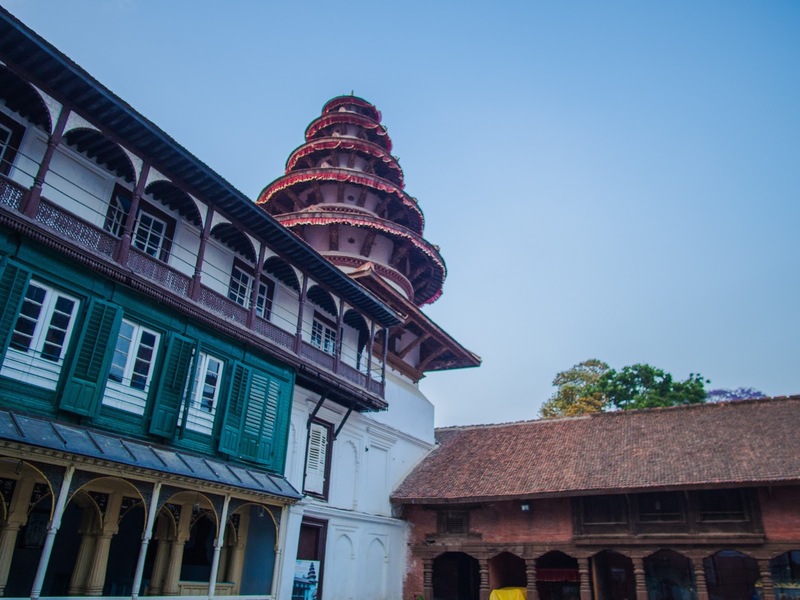 It seems unlikely, for one who's not had a very abundant travelling experience, to reach the departure date on what can be expected to be an ample trip, without some semblance of unease, great excitement notwithstanding. Though not particularly concerned with potential mishaps along the vacation, I couldn't help overthink what I'd packed and whether or not I'd forgot to bring some vital, essential, critical, certain-to-die-without item, so I spent the majority of my time in the Bucharest airport staring blankly through the people passing in front of me whilst running over the contents of my rucksack in my mind. As fruitful a line of thoughts as that may have been, eventually the boarding started, and soon enough I had left Bucharest for hot, sandy Dubai, where I would spend 4 hours before continuing to Kathmandu. Unexpectedly, flyDubai, a low-cost airline, provided food on the first flight, which made the culinary carnival I'd overindulged in in anticipation of a long, voracious day of avoiding paying for airport food seem somewhat redundant. The hours flew by (literally, hah, see?) 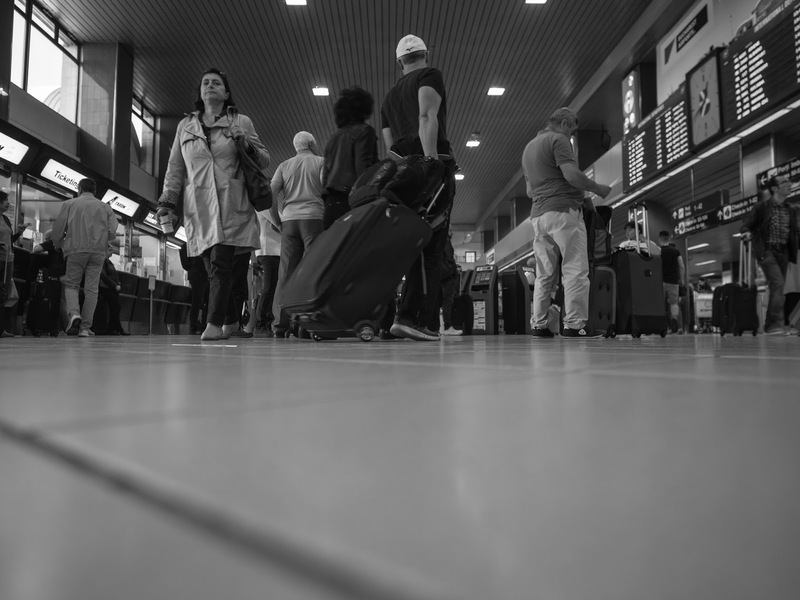 and I soon found myself passing security into the exciting Terminal 2 of the Dubai International Airport, a place I quickly became over familiar with because, as I found out shortly after arrival, the connecting flight would depart a mere 3 and a half hours later. This first glimpse at a completely foreign world (I'd never travelled farther east or south than tourist Turkey) was a thoroughly satisfying one, the terminal being full of a great variety of people, from tourists, like myself, going trekking in Nepal, to Muslim elders presumably going on Hajj to the holy city. With seven plus hours at my disposal, I had plenty of time to go around the terminal enough times to learn its shops memoriter (yet frugally abstain from any purchases), try to start a conversation with a Russian guy dressed for trekking who probably pretended not to speak English to avoid having to speak with me as well as very nearly finish the first of the two books I'd brought with me (which didn't appear to bode very well as far as entertainment reserves for down time went). Eventually, my flight did leave and, while this leg of the journey featured no unexpected but highly welcome feast, it nevertheless was greatly appreciated for its simple, useful capacity of putting me in motion and on the way to my destination. 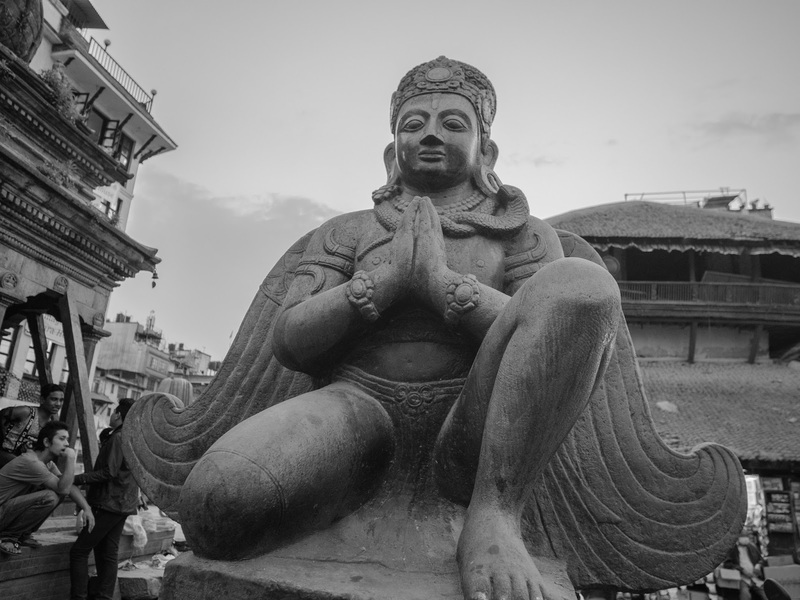 And so, some 20ish hours after I'd arrived in the Bucharest Airport, I finally stepped off the airplane and onto the warm tarmac of Kathmandu's runway. 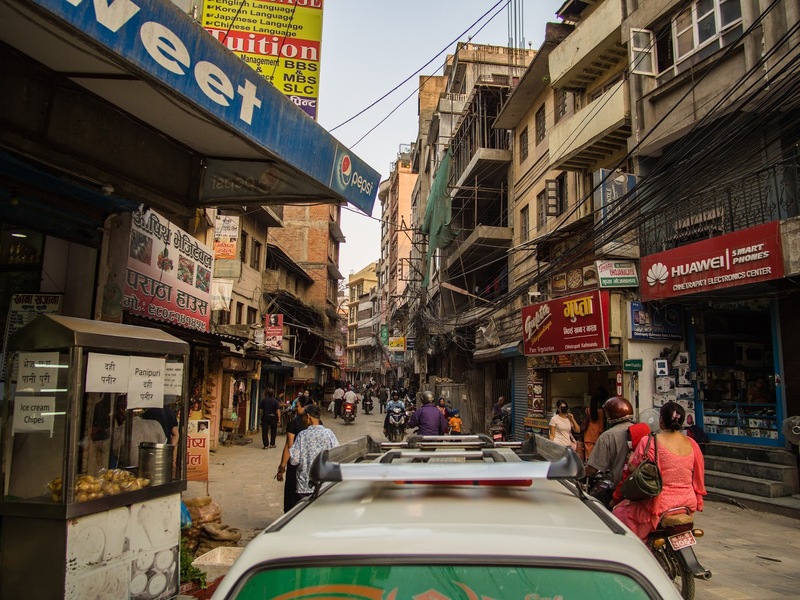 Visa procedures were straightforward, if perhaps a bit excessively bureaucratic (though, I've heard, nothing compared to other countries), and before long I was stepping outside the airport and into the dusty roads of the city. Thankfully, waiting for me was Ang Dawa Sherpa, our (I would later find out) guide-to-be, of whom I'll speak in more detail later and who gave me a ride to the hotel where the rest of the band had stayed for the past three nights. Enthusiastic greetings quickly out of the way, I took a quick nap (sleepless nights spent in airports and airplanes make not the most energetic vacation start), after which the three amigos, already three days in and somewhat familiarised with the city, took me out for late lunch and to see the sights. 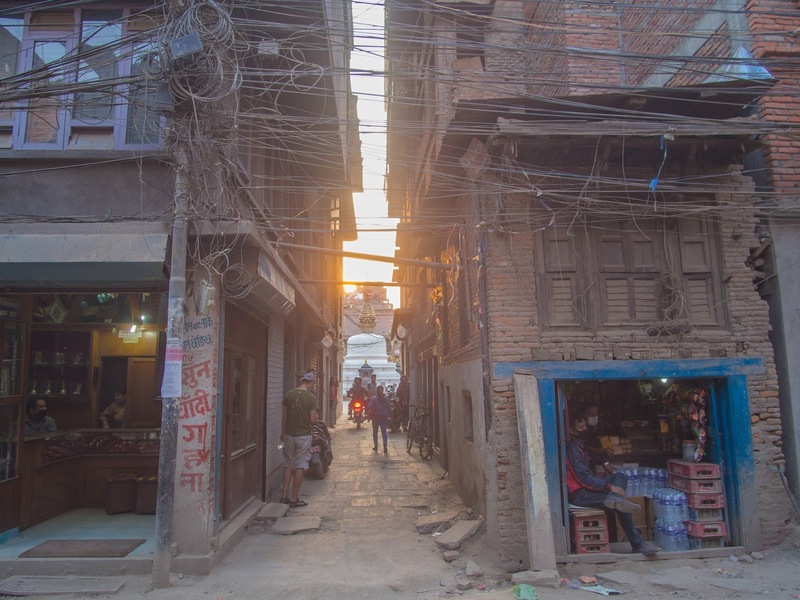 Walking through the streets of Kathmandu was unlike any other city-touring experience I've ever had (though admittedly, I'd scarcely left Europe before). 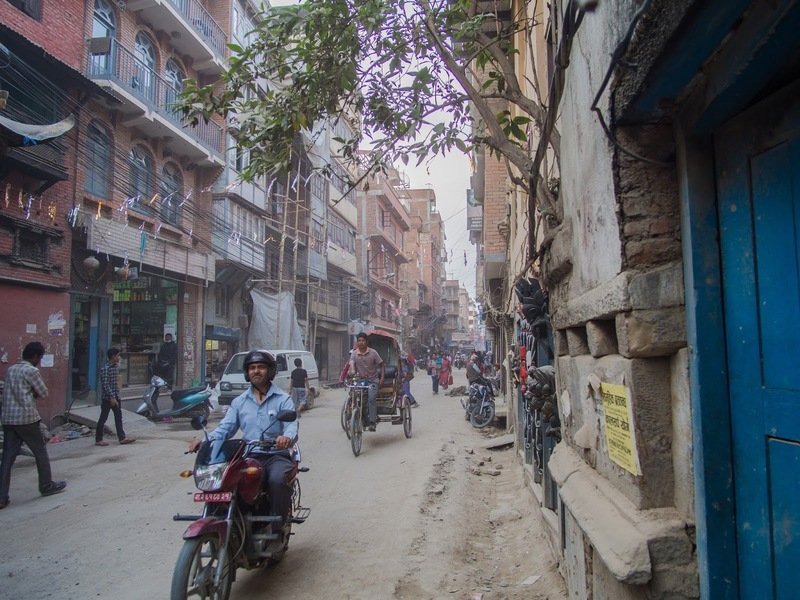 The narrow, intermittently cobbled roads that wind between crowded buildings, many of them in repairs after the 2015 earthquake, are covered by a near constant stream of motorcycles, moto scooters and, width permitting, small cars, engulfing the equally numerous pedestrians in a never-settling cloud of think dust (which quickly explained why every other person was wearing a face mask). 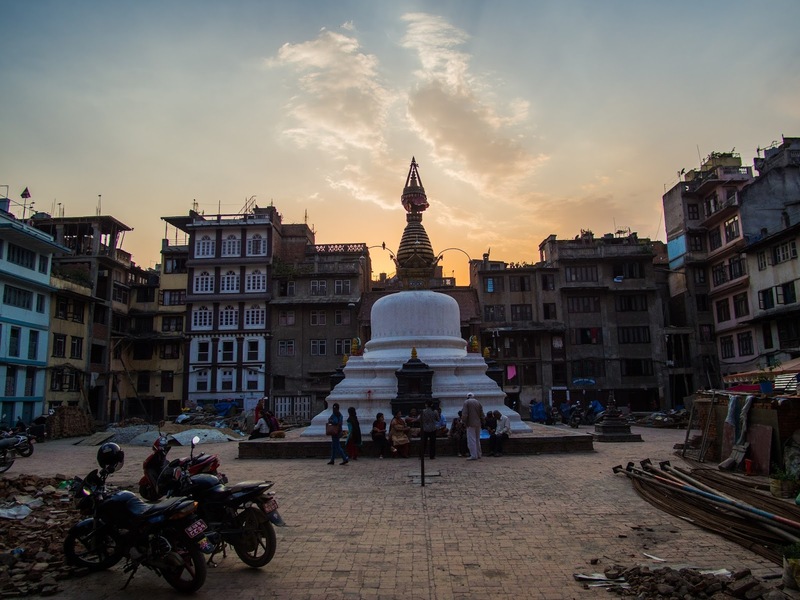 The sun setting behind a stupa behind a narrow street. 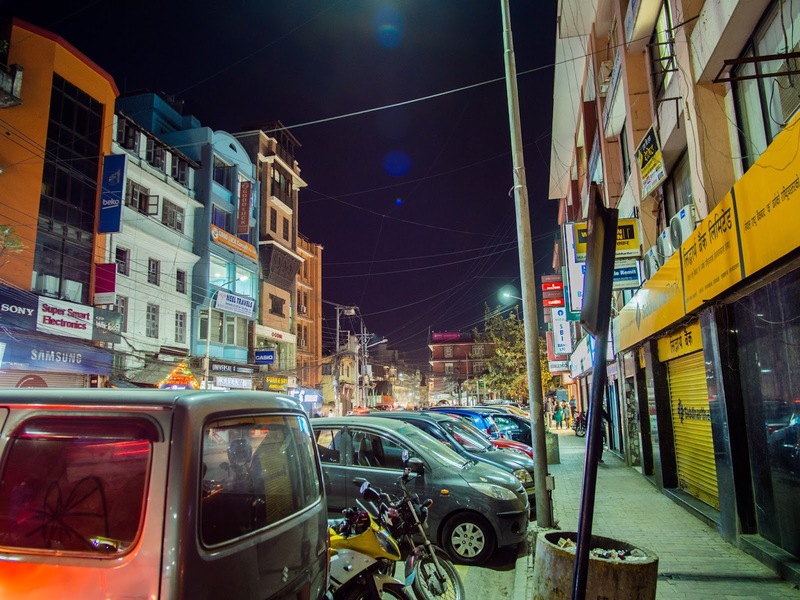 Though my time spent visiting the city was short, I was pleased to find, amongst the chaotic amalgam of dirt, dust, brick, concrete and.. cable (! 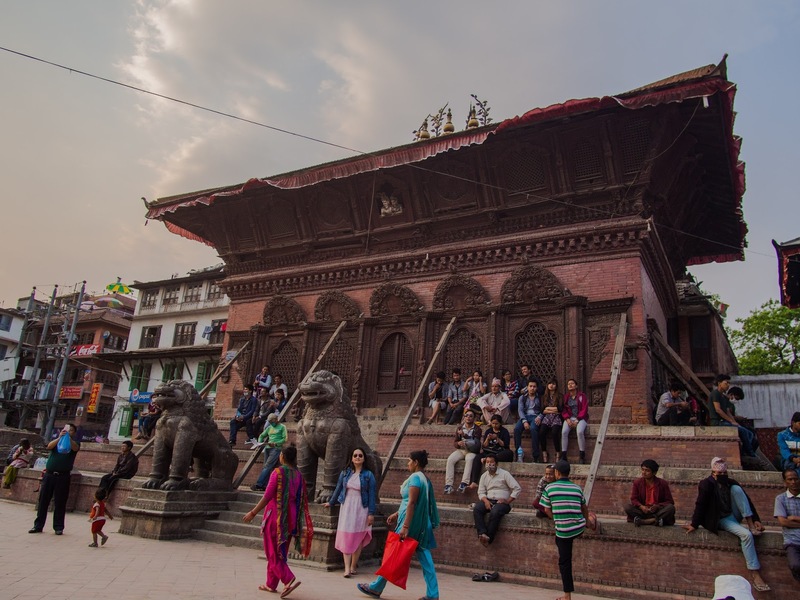 ), constantly traversed by the inexhaustible rivers of people, a quiet nook centered by a stupa, where people sat idly chatting. 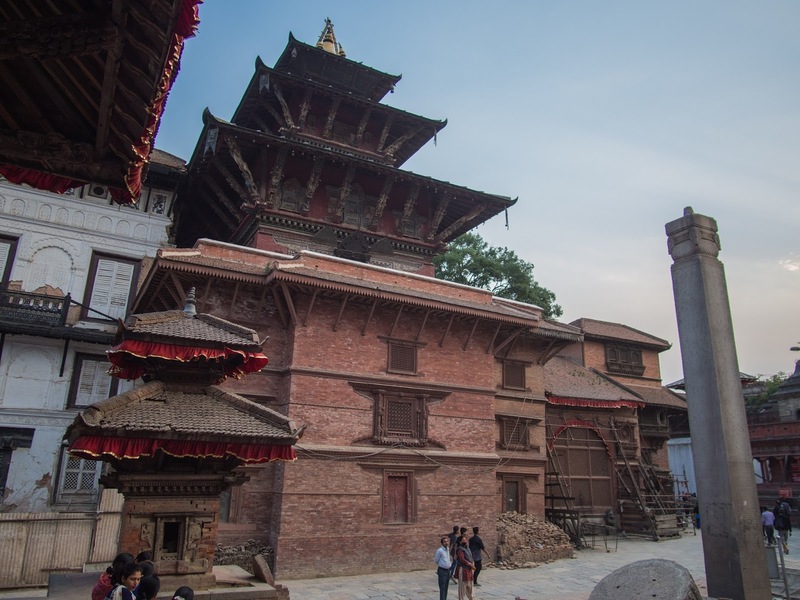 I was likewise pleased to visit Durbar Square, full of edifices whose former glory can easily be recognised, despite the earthquake damage; time and effort will hopefully see them fully restored. My words and pictures here do it justice neither descriptively nor historically informatively, which is why its wikipedia page might be a better source of information. Or better yet, a direct visit! 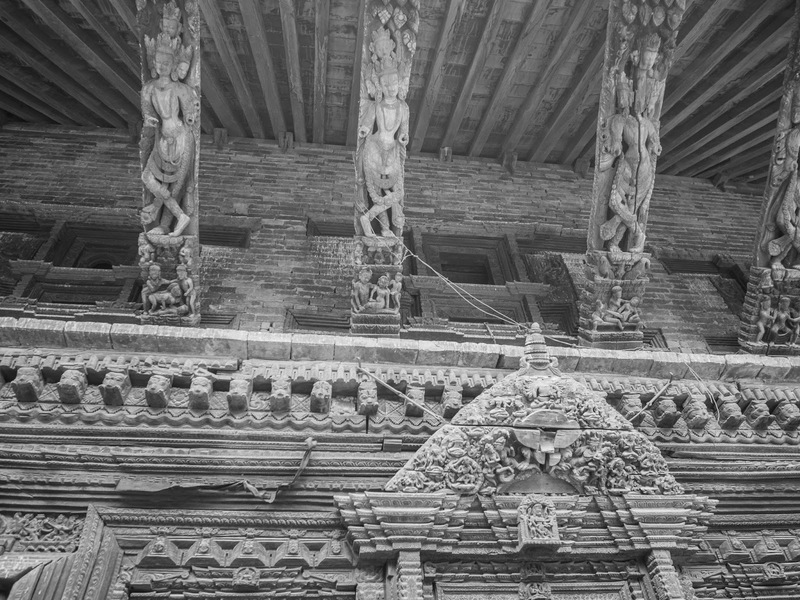 The temple covered with kamasutra imagery seemed to have the most tourists in front of it. It's nice to see reconstruction efforts after the effort, I would very much like to revisit after they're done. A bit of detail, for in depth study. I believe the tower belongs to the king's palace. Cows have a tendency to nonchalantly go where they please in Nepal. Prices across the board were predictably low, with the exception of alcohol, which while not prohibitively expensive, still made a significant dent in the wallet, compared with food. 3$ were enough to get a freshly cooked, decent and filling meal, 5$ meant getting stuffed. Most people, though presumably weary from work, tended to smile at us, at least reciprocally, if not spontaneously, though to be fair we were potential clients for most of the people we interacted with. Although I've no cause to complain regarding the availability of water and sanitary installations, hygiene might appear to be slightly lacking when compared to parts of Europe, and the high number people coughing and casually filling the streets with sputum did point out some shortcomings in healthcare (I later found some WHO estimates - Nepal had 44 thousand new cases of tuberculosis in 2015, with a population of 29 million, compared with Romania, which has one of the highest incidence in Europe, with 16 thousand new cases in a population of 20 million). We got to walk the streets at night as well! 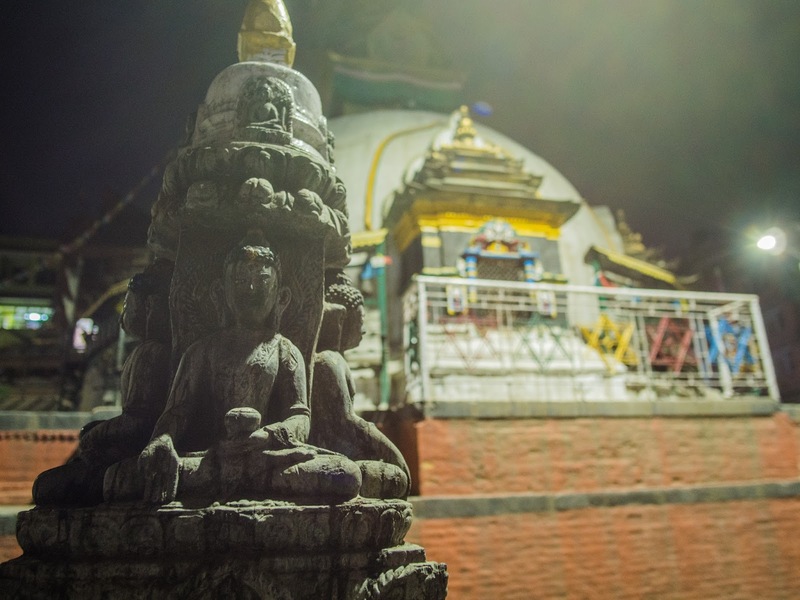 A different stupa in a different nook, made all the more quiet by the night's arrival. First impressions on architecture, food, air quality and the healthcare system passed about as quickly as the first say spent there, which is to say very quickly, and before I knew it it was time to go to bed with the promise of an early wake-up and a long bus ride to Besishahar, the start-up village for our upcoming Annapurna circuit trek. Tired as I was from the previous night (the nap had only alleviated it temporarily), between the increasingly uncomfortable heat, the dogs barking outside, the stuffed nose forcing me to breathe through my mouth and the excitement of finally seeing the Himalayas, my sleep was still restless. Which made little difference in the morning, as the eagerness to go trumped other obstacles and, as soon as the alarm rang, I hurried through the morning routine to get ready, finish last-minute packing and get down for breakfast, only to find, in what would turn out to be a highly predictable pattern, Dawa patiently waiting for us all to come down. Leaving some of the extra luggage at the hotel (a tripod? an extra pair of boots? way to overestimate my carrying capacity) and with breakfast quickly gulped down, we left for the bus station, taking cabs through the city which was already as active as an ant-hill. Dawa guided us through the swarms of people shouting various destinations to our own bus, and soon enough we were on our way. Which is not to say we were quickly out of Kathmandu. In fact, "quickly" is not a word I would use to accurately describe Nepali transportation, except perhaps to say "We're passing another truck, quickly! cover your nose so you only inhale a moderate amount of dust! ", and that's not very descriptive. The trip from the capital to Besishahar, some 175 km long, took at the very least 6 hours (I don't, in all honestly, remember the exact time, but the absolute minimum was 6 hours!). And while I may sound whingy, the truth is it wasn't that bad. It gave me plenty of chances to practice using the telephoto lens I'd only just bought before leaving Romania and it was nice to watch the change of scenery as we left Kathmandu and followed the Prithvi Highway, getting some nice views of the Kathmandu Valley hills, the Trishuli River and several settlements along the way. 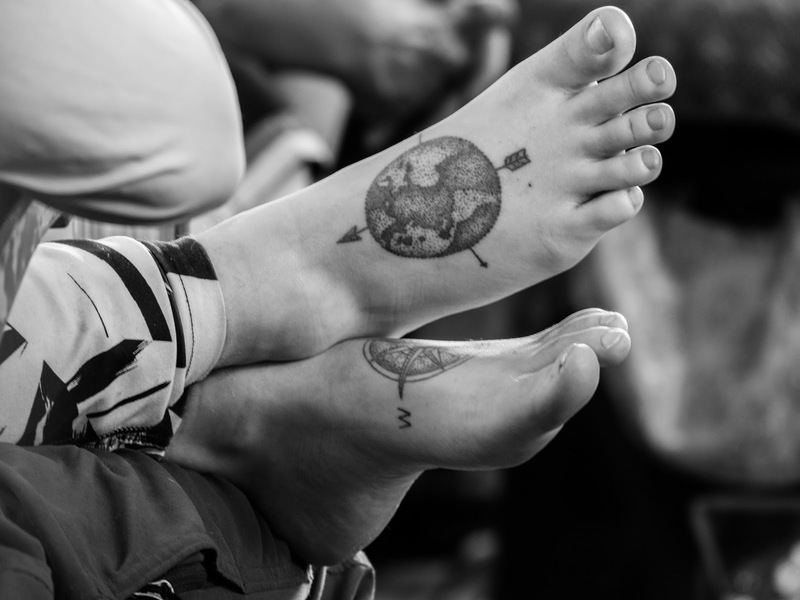 A fellow traveler on the bus had a interesting idea on how to express her probable passion for travel. A piercing gaze, even though I was probably more than 30 meters away. The ambitious plan with which we set out was not only to cross the Annapurna Circuit, but also make a trip up to the Annapurna Base Camp. In order to accommodate that plan in to the unfortunately limited number of days we had at our disposal, we had to shorten parts of the trek and rely more motorised means of transportation. 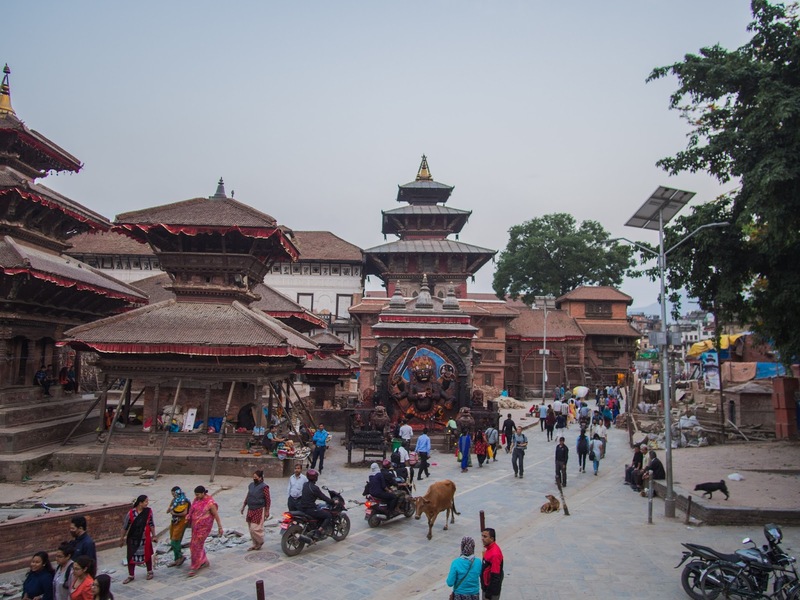 As such, the first two days of the journey (which would traditionally go from Besishahar to Chamje and from there to Dharapani) would have to be done by jeep, rather than foot. So it was that, after reaching Besishahar (with a cheap but satisfying lunch break on the road earlier), we merely switched from one lumpy seat to another and continued on the bumpy road to Dharapani. The change in landscape was now obvious, with hills (or as we'd call them in Romania, mountains) covered in thick deciduous forests surrounding us and the Marshyangdi river flowing alongside the road, topaz blue (I guess? I don't really know colours, that's the first type of blue that came to mind) and rapid where the Trishuli before it (or after it, rather, if you consider the direction of the flow) had been brown and slow. We enjoyed the truly impressive views for as long as we could before night crept over us and we drove the last hour or so of the journey in darkness. Eventually we reached Dharapani, where after a delicious dal bhat dinner and short session of dinner socialisation around the table, we retired to our rooms and quickly drifted to sleep (or at least I did) thoroughly enthusiastic at the prospect of finally being in the hills (mountains!) and starting our journey the next day.